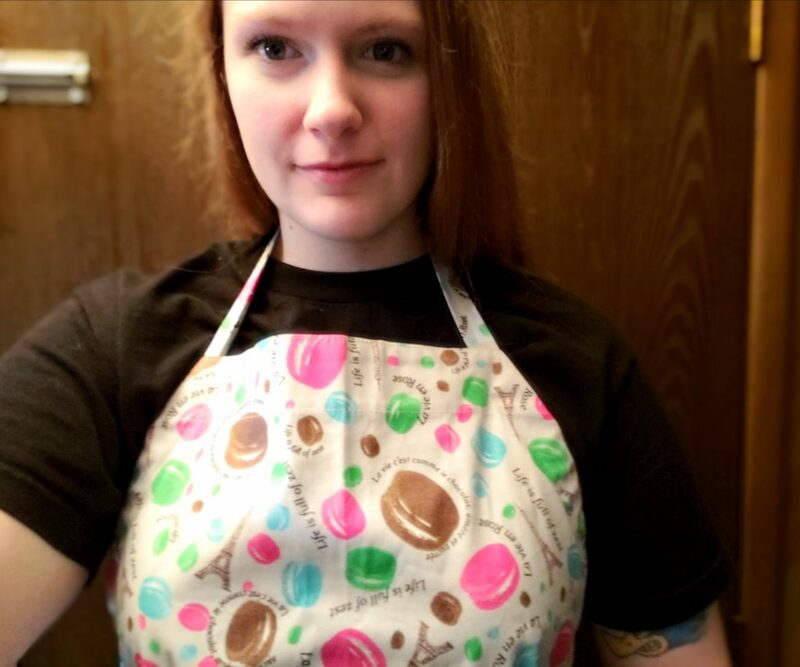 Macarons are Emily Maxine Gisler’s specialty, but being a pastry chef who lives on Drury Lane, she has to do muffins too. And with so many muffins, cupcakes and macarons to try, I fully anticipated the “muffin top” (a roll that spills out over the top of one’s jeans or even worse, sweatpants) that I would inevitably meet from overindulgence. Gisler, pastry chef and owner of Macs to the Max, gave me two brimming boxes of aromatic delights for tough tasters who would be unknowingly guinea-pigged. But what better way to celebrate my dad’s 80th birthday than to have a pastry-tasting bonanza. I was eager to get the pastry-tasting party started. 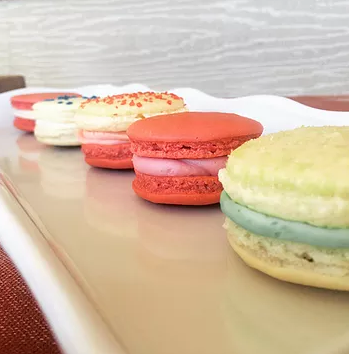 Twelve macarons with four distinct flavors, along with muffins, cupcakes, and scones from the Grants Pass bakery had to be tasted in one sitting for peak freshness. Without my family crew, I would have eaten twenty-two calorie-laden delicacies by myself. Yet, trying all Gisler’s flavors like Smores, Cookies & Cream or her more elegant flavors (vanilla bean or chocolate ganache) or even the unusual ones such as green tea matcha, Bailey’s, or chai tea would have been supreme. Given the occasion, the birthday cake macaron was sampled first. Wowza! “The interplay of textures was wonderful. It had a very crisp start and dove right into a creamy, buttery filling,” remarked my husband. My mom poetically called the macaron a “portable pleasure.” While she was oohing and aahhing, my son ate two macarons without sharing with his grandpa. So, in haste and retaliation, my dad sampled a hearty chocolate chip-zucchini-banana-muffin covered in cream-cheese frosting. He remarked, “Visually interesting, quite moist and light with a subtle banana flavor.” If he was expecting bold banana, I could not tell. Next, was the walnut-caramel macaron. A crispy praline dream with a soft-center. The robust experience of biting into something crunchy and then tasting the not-too-sugary caramel flavored filling was divine. Vanilla and strawberry macarons finished out our French taste test, but there was more to go before we hit the sugar crash. A vanilla cardamom cupcake with an edible pearl on top tempted us. Both the vanilla and the chocolate rose options were remarkably light with frosting piled high on abundant cakes. Ultimately, the vanilla cardamom won over my son, but I reminisced about the walnut-caramel macaron – my favorite. Eating just one was not enough. Scones rounded out our adventure and bellies; one lemon and the other blueberry. They “looked plentiful and full of life but did not stand out in a crowd,” said my mom. They were light, moist and had a fantastic consistency, but too mild in my opinion. Maybe they should have been eaten first. Overall, the flavors and pastry choices combined were satisfying to the max. On January 18, Macs to the Max will roll out their Valentine’s Day menu on Facebook and their website. They started a little under a year ago in February 2018 and will have their one-year anniversary soon. Gisler hopes to open a full-fledged French pastry shop and every order gets them closer to that goal.